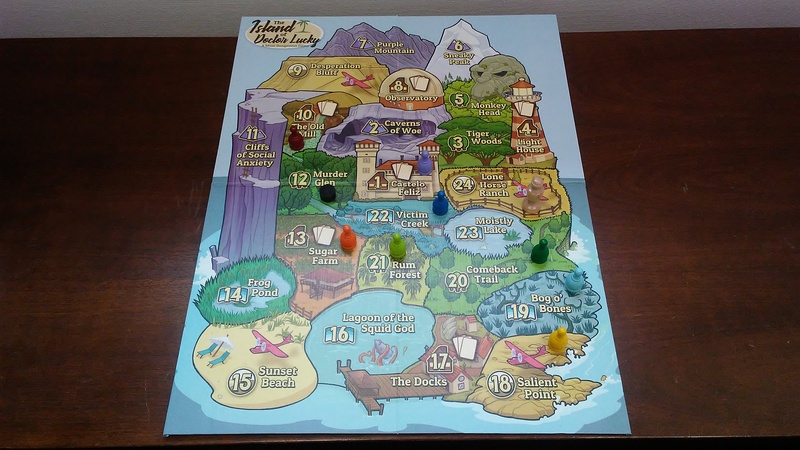 The Island of Doctor Lucky is a game by James Ernest, published by Cheapass Games. It is for 2-8 players. In this game, players take on the role of a vengeful killer in the guise of a close personal friend to the infamous Doctor Lucky. They will be doing their best to take him out in any way possible. However they’ll need to be careful, as their opponents are also looking to end his existence as well. They might even use the island to their advantage to also remove the other players from the picture. In the end, the player that can actually muster up the skill and luck to bump the good Doctor off, will be declared the winner. To begin, the board is placed in the middle of the play area. Each player will choose a character card and take the corresponding pawn. The player will then place the character card in front of themself and their colored pawn on Castelo Feliz. The Doctor Lucky pawn is placed on Sunset Beach and the cat pawn is placed on the Observatory. 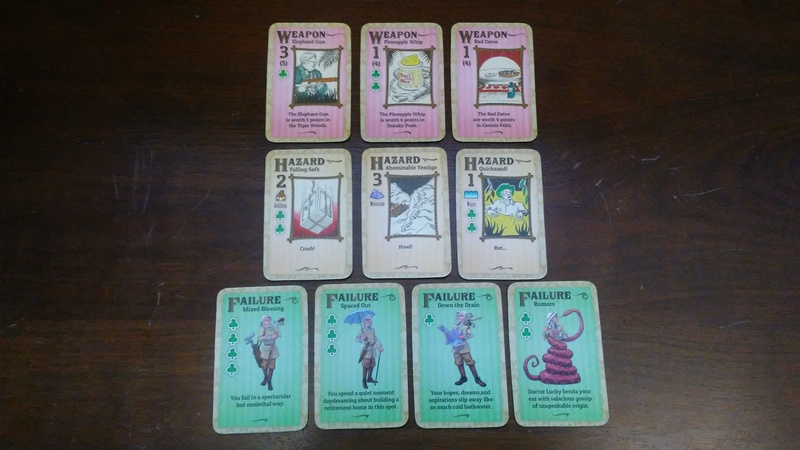 The weapons, hazards and failure cards are shuffled together to form a deck. Each player is then dealt a number of cards to create their starting hand. The number of cards is determined by the number of players. Once the cards have been dealt, the deck is placed face down beside the board. The first player is chosen and play now begins. The game is played over a series of turns. Each player will take a turn consisting of two steps called Phase 1 and Phase 2. In Phase 1, a player is allowed to take 1 of 3 actions. They can move their pawn, move the cat or play a hazard. The first action is to move your pawn. In this action a player is allowed to move from one region to an adjacent region. If they are on a region that contains an airplane, then the player may move their pawn from one region to another, as long as the other region has an airplane on it as well. Another action that the player may take is to move the cat. The cat pawn may be moved from one space to any other space on the board. It should be noted that when the cat pawn is on the same region as another player or Doctor Lucky, they are unable to see outside that region. Normally player’s and Doctor Lucky are able to see each other on the same space and on any regions that are adjacent to the space they are on. The final action that may be taken by a player in this phase is to play a hazard. Hazards are traps, creatures or terrain that may be played on other players or on Doctor Lucky if they are alone and in the right type of space. Being “Alone” means that no other pawns, including Doctor Lucky or other players, are on the same space. The cat pawn isn’t included in this. That means that a pawn may be on the same space as the cat pawn and still have a hazard played on them. When a hazard is played on another player, the player must pay one of 2 penalties. They may either pass that player a card from their hand or they must discard enough luck from their hand to match the value of the hazard. If a target player’s hand is empty, they suffer no penalty. Playing a hazard on Doctor Lucky acts the same way that a murder attempt does and will be explained in a bit more detail in a moment. Once a hazard has been played, the player that played it places the card face down under their character card on the “+ move” side, gaining +1 to their movement. Of course if a player may choose to do none of the previous actions and may choose to simply stay where they are by passing. In Phase 2, the players have two actions to choose from. They can either draw a card or try to kill Doctor Lucky. If they choose to draw a card, they will simply take the top card from the deck. However, a player may not draw a card unless they are unable to be seen by the other players or Doctor Lucky, as explained earlier. The other action that a player can take is to make a murder attempt. A player may choose this action if they are alone with Doctor Lucky and no one else can see them, as explained earlier as well. The player is allowed to play a weapon to improve their attack, or they may simply choose to use their bare hands. A player starts with a basic attack of 1. This is increased by unsuccessful murder attempts by the player, more on this in a moment. If the player chooses to use a weapon, that card’s weapon value is added to their attack value. In certain areas, a weapon will have a more improved value. Once the player’s final attack value is determined, their opponents may discard as many cards as they wish to contribute to Doctor Lucky’s Luck value starting with the attacking player’s left and going around the table one time in order. Each shamrock found on a card is worth 1 Luck. If the other players discard enough Luck to equal the attacking player’s murder attempt, then Doctor Lucky lives and the game continues. If enough Luck wasn’t discarded, then Doctor Lucky dies and the murderer wins. If the player’s murder attempt was thwarted then the player gains +1 attack for any future attempts. This is shown by placing either the weapon card that was played or any discarded card beneath the attacking player’s character card below the “+ attack” side. Much like the “+ move” side, each card beneath this area adds 1 point to the corresponding value. 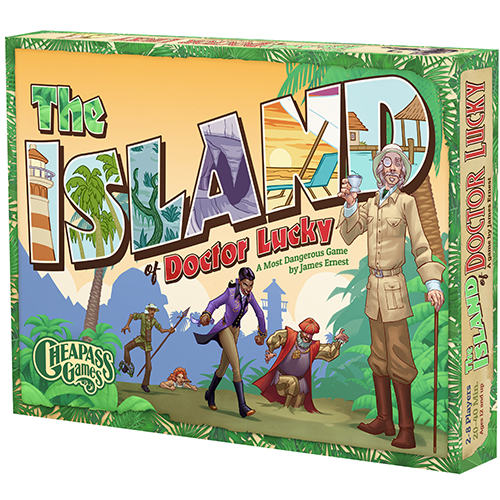 Once a player finishes their turn, Doctor Lucky moves around the island. The pawn for Doctor Lucky moves to the next region in order. So starting at region 15, he will move ahead to region 16 and stop. Once he reaches region 24, his next move would be to region 1. It should be noted that when Doctor Lucky moves, he can sometimes cause players to draw cards and can even change the turn order. On the board there are several regions that contains buildings. These are noted with a card icon. If Doctor Lucky moves into an empty building, that is to say a building that contains no players, then any player that has fewer than 3 cards will draw a card. Cards are drawn beginning with the player to the left of the last active player and proceeding around the table. If Doctor Lucky moves into a space with a player, then the turn jumps to that player and play will then move to the next player to the left of them going forward. This rule does not go into effect until each player has had at least one turn. One more thing of note, if Doctor Lucky moves into a space with occupied by more than one player, then the turn moves to the player that is closest to the left of the last active player. One final thing of note, there is a special mechanic that is known as “Riding the Lucky Train”. This is when a player moves one step ahead of Doctor Lucky which then allows the player to go again once Doctor Lucky moves into the same space with them. A player can wind up taking several turns in a row by doing this. After Doctor Lucky completes his movement and any other issues are resolved, play passes to the next player in turn order. The game continues until one of the players either plays a hazard on Doctor Lucky or makes a murder attempt on him and succeeds with either one. The player that kills Doctor Lucky is the winner. The game doesn’t come with a whole lot of pieces, but that’s ok. What it does come with looks pretty good. There’s the gameboard where all of the action takes place. The board is really great quality and has a nice linen finish to it. The artwork depicts a dangerous island with lots of different land marks. There’s the Sneaky Peak, The Bog o’ Bones and the Tiger Woods. Yes, that’s right…Tiger Woods. Try killing the Doctor with a 9 iron while you’re there. Just saying. I have to say that the design here is really fun and light hearted. I really love the look of the island and get a kick out of the names of some of the regions. The game also comes with some really great looking wooden pawns too. There are 7 different colored player pawns, a Doctor Lucky pawn and a disc for the cat. The color of the player pawns correspond with the one on the matching character card. I really like the choice of colors used here. The Doctor Lucky pawn is a bit larger and is a different design. It has more of a natural wood finish and it kind of looks like a guy in a suit with a hat on. Of course that’s just my take on the design. The cat is just a simple thick black disc. While I think that the game could have used meeples for the different characters and possibly even a cat meeple for the cat, I have to say that I rather like the simplistic design of these wooden pieces. Granted, they aren’t really thematic to the game but they’re good quality and give me more of a retro Clue type feel to them. The final part to this game is the cards. There are 4 types of cards. 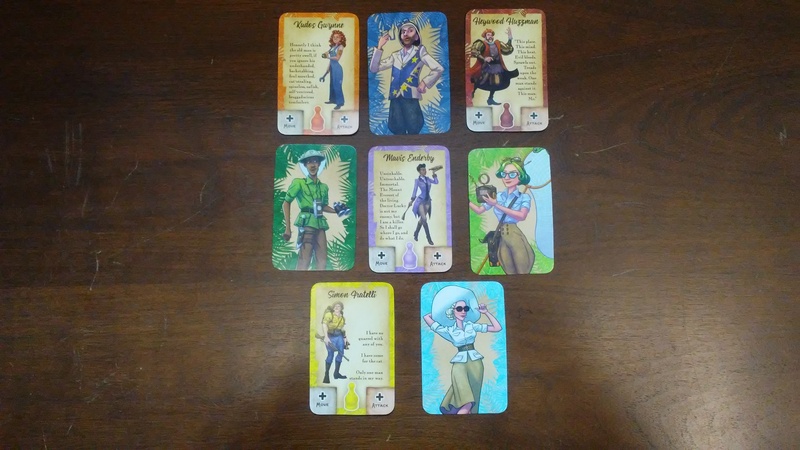 There are the character cards. One side of these has a brief statement from the character along with a full body picture of them along with the colored pawn that represents them. The back side has a closer picture, more like a portrait. I really love the artwork and sayings on these. They really look nice and help you get into character a bit. Next there are the Failure cards. These have 1 of 4 different pictures of Doctor Lucky on them, along with a number of shamrocks from 1-4, as well as a quick little quip about the particular failure. Like the character cards, these look great. I love the Doctor Lucky character designs and find the different quips kind of funny and mildly thematic. Then there are the Weapon and Hazard cards. The weapons have two different numbers on them. The larger number is the attack value that can be used anywhere. The smaller number in parenthesis is the attack value that is used for a specific place, which is also noted on the card. Hazards have a specific type of regiond where they can be used along with a damage value. Some of the Weapon and Hazard cards also have shamrocks which can be used to help thwart another player’s murder or hazard attempt on Doctor Lucky. Finally, both the weapon and hazard cards have a piece of artwork on them representing the particular weapon or hazard. This is probably the one thing about the cards that I don’t like. The artwork is so much fun on everything else, but the artwork on these doesn’t even look like it came from the same game. This looks more like something from the 1890’s. It looks like a badly sketched design that someone used colored pencils on. If you’ve ever seen the artwork from the original Alice in Wonderland book, then you kind of get what I’m talking about. The artistic designs are fairly similar. I mean I kind of get what they were going for, but I really wish that they’d continued with the already fun and great looking artwork that had been used on everything else. Apart from that, the game looks great. I really like the designs and find it to be fun looking game. The rulebook for this game is fairly small. Much like the other games from Cheapass Games, the book is only a few pages long. The book starts with a little bit of a back story behind the game. From there it goes into the basics of the game along with a break down of the components. The next 2 pages explain the different phases of a player’s turn and also how Doctor Lucky moves. Finally the back page of the book contains a few rules changes for 2 and 3 players, along with how to win the game. The basic rules are for 4 or more players. These rules help keep the game from ending too quickly by adding a few automated players to the mix. For more details on these rules, please check the rulebook. I will say that there aren’t a whole lot of pictures in this rulebook. There’s a nice picture that shows how to add to a character’s movement and attack value, by placing cards under their character card. There’s also a couple of iconography pictures and a couple of art pieces. I rather like the art pieces, especially the one on the back cover with Doctor Lucky’s cat. The rules do explain things rather well, using some examples in the text. However a few times I found myself looking back or ahead to figure out a specific rule or understand how something worked. Thankfully with the book only being 4 pages long, it’s not that difficult to do. For that reason, I won’t judge it too harshly. The rules aren’t that difficult to understand and should be fairly easy for anyone to read. Overall I think they do a good job of conveying the rules in a reasonably simple manner. If you’ve ever played any of the Kill Doctor Lucky games, then you probably already understand the concepts behind this one too. You move around the board trying to get Doctor Lucky alone and kill him. Simple, right? However this version also has ways of hurting the competition, as well as a optional game rule that allows you to eliminate them altogether. I have to say that I really like this new version. I like the optional rules and will, more often than not, choose to use the elimination rule. It sort of adds a new dimension to the game that the other versions don’t have. With that optional rule in play, you really have to keep an eye on your hand and try not to run out of cards or you could fall right into an opponent’s hands. Needless to say, I like this version even more than any of the others that I’ve played. I love trying to get everything lined up, only to have the old codger luck out due to some help from my opponents. No wonder he’s called Doctor Lucky. I can say that I’ve always enjoyed the Doctor Lucky games, most likely because I always enjoyed Clue as a kid. These games are kind of like a reverse version of Clue but more fun. This one is no different. Fans of any of the Doctor Lucky games should enjoy this one too, especially if they like a little more player interaction. If you’ve never heard of or played one of these but you like Clue, then I’m pretty sure that you’ll enjoy this game too. This is one that I would recommend. It’s not overly complex but can provide enough strategy for everyone to enjoy. This one is family friendly and is one that even the younger players can take part with. Overall, I enjoy this game. It’s the best of the series so far for me. The Island of Doctor Lucky is a light weight game of murder on a dangerous island. This isn’t a very long game. Most game sessions last around 30 minutes or so. The artwork on board and some of the cards is really fun and looks great. However the weapons and hazards cards feel a bit disconnected in terms of the artwork. They almost look like they came from a different game. The wooden pieces are very nice and give a real classic board game feel to this one. I do think that they could have been updated a bit, possibly into some screen printed meeples or something of that nature. The rulebook is pretty well written and includes a few special rules for playing with less than 4 players, as well as a fun variant that I wouldn’t play without. The game itself is a lot of fun. I really like the addition of the hazards and how that they can be used against other players. I especially like using the elimination rule for playing hazards against your opponents. For players familiar with any of the previous Doctor Lucky games, this should feel familiar but with a bit more fun to it. Fans of those games should enjoy this one. I would also think that anyone that enjoys Clue should also like this one too. This is a game that I would recommend. I like it a lot. For me, it’s the best Doctor Lucky game in the series. It’s family friendly and a lot of fun to boot. Now if I could just figure out where I put that elephant gun. This entry was posted in Reviews and tagged board, board games, card, card games, cheapass, cheapass games, doctor, doctor lucky, ernest, games, island, island of doctor lucky, james, james ernest, lucky. Bookmark the permalink.